GUARDIANS OF THE GALAXY is perfection for both longtime fans and new readers alike. In Cates & Shaw we trust. 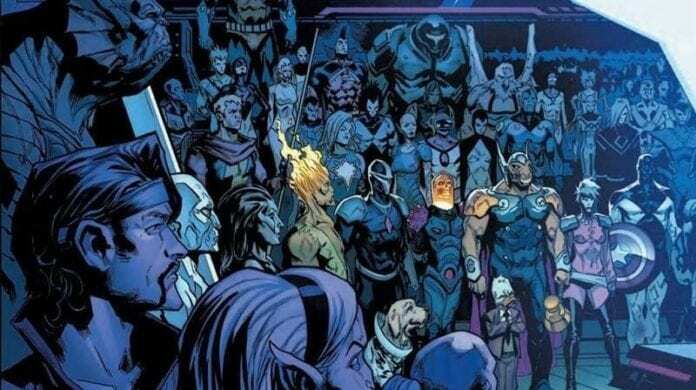 A new age of Guardians Of The Galaxy is upon us and the galaxy “is broken.” The all-star duo of Donny Cates and Geoff Shaw (THANOS) takes us back among the stars. Thanos is dead and all the major players of the galaxy are shook. Eros collects all the heavy hitters in one place to share the posthumous threat made by his fallen brother of Titan. 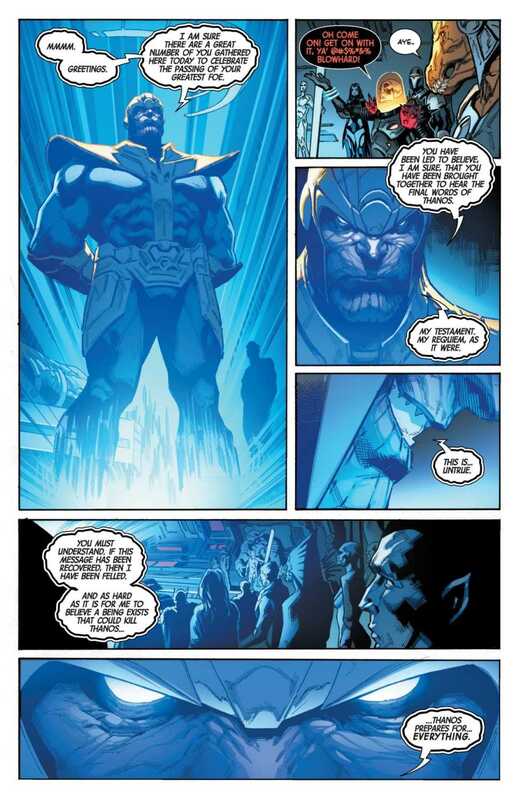 There will soon be a new Thanos and the only way to prevent it requires a lot of blood and guess work. Guardians Of The Galaxy #1 has the gravitas of a major Marvel event’s opening chapter. We learn the stakes, meet the players, get a dramatic shake-up (thanks to an attack by The Black Order), and blast forward into an exciting new adventure with a new core cast. With Drax having died, Gamora becoming a villain and Rocket elsewhere, Peter Quill and Groot reload their crew by being in the right place at the right time. In perfect GOTG fashion, Quill accidentally rescues a handful of survivors of the Black Order’s attack. 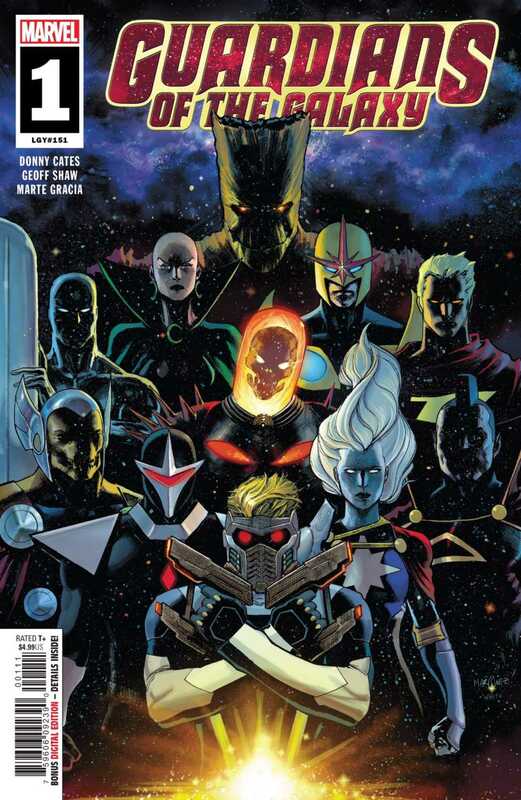 Thanos’ generals have his deceased body, but now Quill and Groot are joined by Cosmic Ghost Rider, Moondragon, Phyla-Vell and Beta Ray Bill. That’s a stacked lineup of cosmic Marvel favorites, GOTG all-stars, and the hottest new character in the 616. We’ve got ourselves a race across the galaxy to find and stop this “new Thanos” before it’s too late. The way our story is setup and laid out is masterful. Guardians Of The Galaxy #1 manages to satisfy and immediately hook longtime fans and new readers alike with an infectious tone and explosive plot. Donny Cates has been having one hell of a go at Marvel. This series seems to be another perfect fit, he wastes no time injecting his personality and trademark “punk/metal” appeal to a title that has plenty of room for it. Even giving Groot a mohawk and punk attitude fits perfectly. As a longtime GOTG fan, the voice and attitude Cates has for Quill is reassuring. Long gone are the days of Bendis’ misguided run and the overreaction to Chris Pratt’s movie portrayal of Star-Lord. Quill is back to being the “Indiana Jones of space” that’s always in over his head but always up for the task. Teaming up with Thanos collaborator Geoff Shaw once again was a brilliant decision. They pick up right where they left off creatively and clearly have much more to say about the weirdness of Marvel’s cosmic frontier. Shaw’s illustrations are as sharp and dynamic as ever. 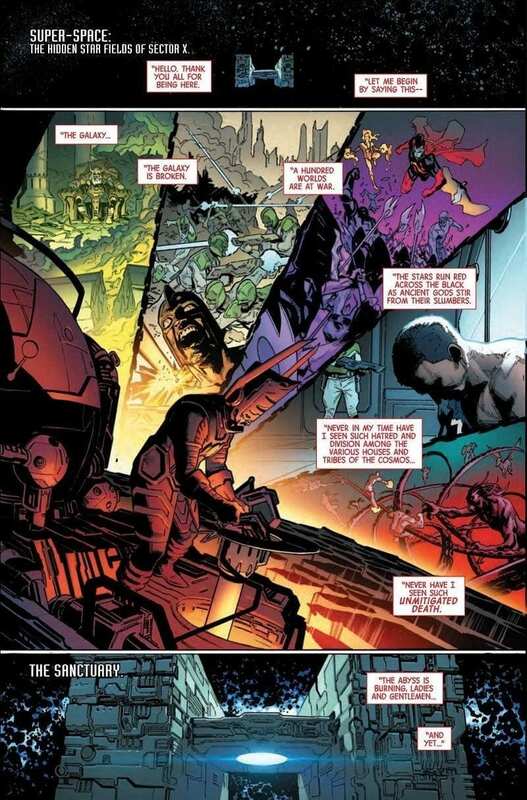 His vision for cosmic characters and settings is wonderful, his Guardians panels have a bit more of an edge to them. Shaw has the ability to perfectly convey both the attitude and comedic timing of Cates’ scripts. Marte Garcia does spectacular work as always, especially with the large cast of characters to breathe life into. The opening scenes with the meeting room full of the universe’s heaviest hitters warrant more than a quick read and page turn. From the script to each and every panel, this series seems hellbent on delivering us back an age when cosmic stories mattered on their own. This feels like a major crossover event without any of “Earth’s Mightiest Heroes” and that’s a big deal. This could be the beginning of a renaissance for the best corner of Marvel’s universe. Guardians Of The Galaxy #1 is everything you could’ve wanted from a launching point for our favorite cosmic assholes. The new crew is one fans have been dreaming of for years. You couldn’t ask for a better creative team to elevate the title to new heights. Don’t miss what will most likely be one of Marvel’s must-read comic books going forward.